Look up into the night sky of Northumberland’s International Dark Sky Park and enjoy the marvel of up to 2000 stars at any one time. 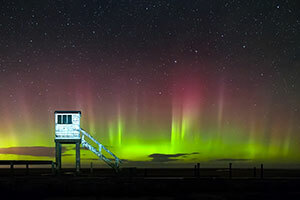 The Northumberland International Dark Sky Park is Europe’s largest, stretching across 1470 square kilometres of breathtaking scenery combining Northumberland National Park with Kielder Water & Forest Park. Due to its unspoiled skies and minimal light pollution it was awarded gold tier designation by the International Dark Sky Association, making it officially the best place in England for people to go to enjoy the night sky. Autumn offers prime viewing time, the nights are properly dark and the Milky Way can be seen overhead. Throughout November you might be lucky enough to see Meteor showers. As the temperatures drop in the night sky during the crisp winter months, the sky becomes more transparent making it even easier to see the glittering skies above us. It’s not just the Dark Sky Park where you can experience the beauty of the night sky. 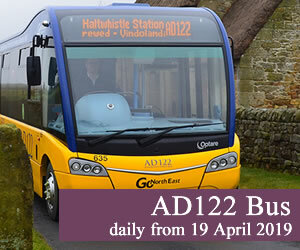 Head to the Northumberland Coast and with the right weather conditions you might be lucky enough to see the amazing Aurora Borealis. Commonly known as the Northern Lights, the Aurora Borealis is a spectacular natural light display. You don’t need an expensive telescope to enjoy Northumberland’s dark skies, just wrap up warm, pack a pair of binoculars, a hot drink and bite to eat and head off to enjoy a star studded show. If you’d like to learn more about the night sky there is an exciting range of Northumberland Dark Sky Events including regular events at The Sill National Landscape Centre on Hadrian's Wall, Kielder Observatory, Battlesteads Observatory and throughout the Northumberland National Park. 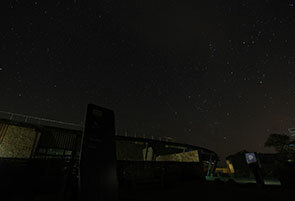 Battlesteads Observatory, located at a Dark Sky Discovery Site in Wark and under very dark skies, offers the perfect compromise between the beautiful majesty of dark skies and the facilities offered by a 21st Century Countryside Village location. Benefiting from good access by road, the observatory is accessible whatever the weather and even on a cold night you'll be cosy in the observatory warm room. If you'd prefer to stay the night the adjacent Battlesteads Hotel & Restaurant offers luxury accommodation and superb meals.